1. Clemson - Basically their entire offense is back including preseason Heisman favorite Deshaun Watson. The defense loses some key cogs but they got a ton of depth waiting to plug and play. Dabo will have them foaming at the mouth next year. 2. Alabama - It doesn't matter who they lose on the field or on the sidelines because the defending champions will have Nick Saban at the helm. 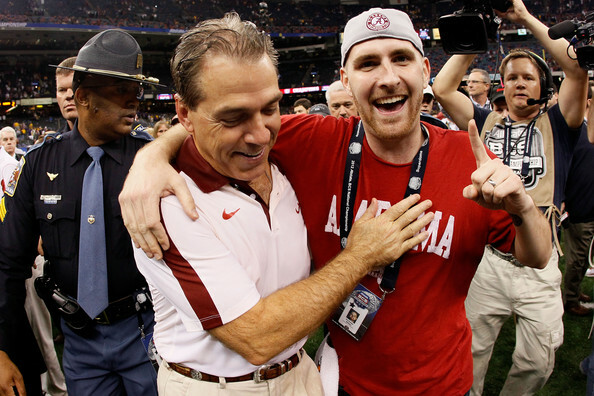 Until Saban is retired you have to put Bama in your top 4 every season. 3. Stanford - Christian McCaffery is back and should put up Heisman numbers. David Shaw has proven he can win big games and Stanford has a ton of young talent ready to step in and play. 4. Ohio State - The Buckeyes are probably losing the most elite guys including their two best in Bosa and Zeke but JT Barrett is back and you know Urban Meyer will have them competing for another title. 5. Notre Dame - If ND can get over the injury bug they should explode next year. The offense will be unstoppable with either Kizer or Zaire behind center. But who replaces Jaylon Smith? 6. FSU - The Seminoles are a good QB away from being a playoff team. It could be freshman Malik Henry next season. If he can hand it to Dalvin Cook and let him do his thing then FSU is a legit playoff contender. 7. LSU - Leonard Fournette is back. That's all you need to know. Also they are loaded with talent. Sure Les Miles isn't the greatest coach in the world but I got a feeling LSU wins the SEC West next season. 8. Oklahoma - Can Baker Mayfield lead the Sooners over out of conference opponents Houston and Ohio State next year? If he can then the Sooners are back into the playoffs. 9. Oregon - I think the Ducks rebound from a "bad season" and battle Stanford for the PAC 12 Title. 10. Michigan - The Wolverines are going to be scary good with Jim Harbaugh getting more of his players in there. I would not be shocked at all to see them go undefeated into the Big Ten title game. The Bama fan is a refined individual. An art piece* one would say. Stay classy Gump fans. 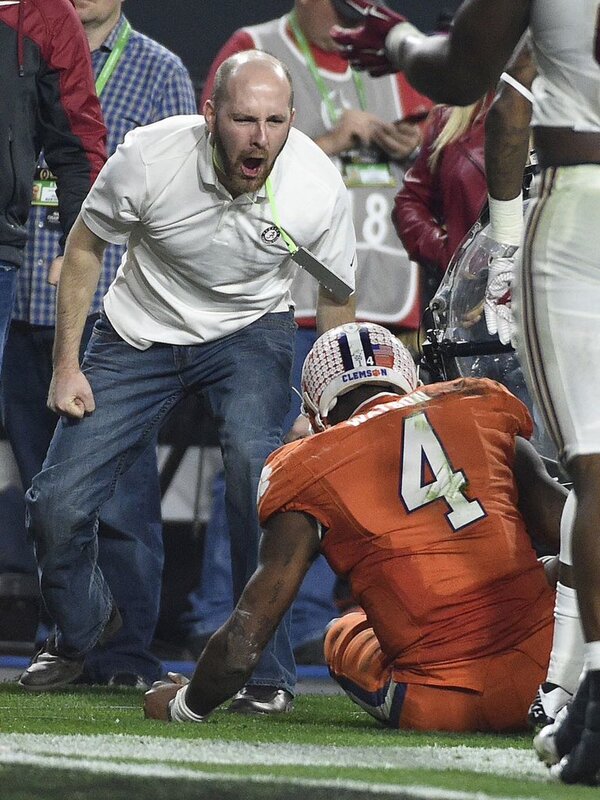 The Gump fan appears to be none other than Nick Saban's son. Check out the pictures below and you be the judge. Just like when you hear Bama fans claim they have "16 Titles" now it's almost impossible not to laugh at this ESPN Deportes call of Bama's Kenyon Drake taking one to the house in the National Championship game. Last night the game lived up to the hype for once. Clemson played great, in particular QB Deshaun Watson, but Alabama was just too tough and a couple of big special teams plays were the deciding factors in a 45-40 game. Clemson fans shouldn't hang in their heads in defeat. They got a ton of pieces coming back and could very well be the preseason #1 with a hunger to complete the mission. Bama also will just reload with 5 star studs everywhere waiting to break into the starting lineup. Losing defensive coordinator Kirby Smart to Georgia will do nothing in terms of Bama's current dynasty. 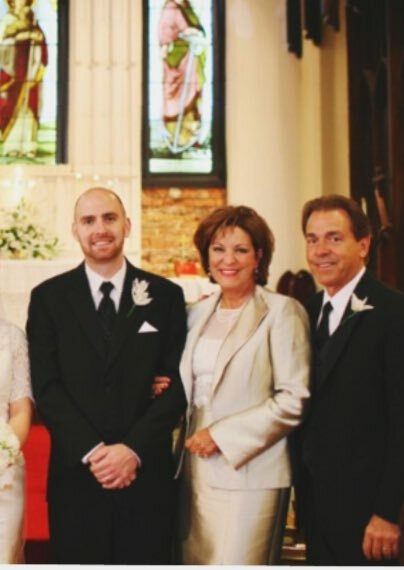 We all know Nick Saban is the brains behind the defense and the overall team. Until then September 3rd can't get here fast enough. The college football season is over but we still got signing day coming up on February 3rd and spring games will be here before you know it.